Enter your email below and I'll send you a password that will allow you access to all of my free content! "The social media phenomenon is still ramping up and this book provides useful and timely business advice." "Lon is a serial technologist who really understands social media and is also blessed with the gift of being a great communicator. His book deftly takes you from "Social Media 101" all the way to PhD status in a format that is easy to browse, informative and powerful." "Effectively harnessing the power of social media is a top priority in corporate America. “The Social Media Bible” with its informative and tactical approach, provides an easy-to-follow roadmap for how to do social media right." "Social Media and Customer Care are rapidly coming together. This Second Edition is a must read for any professional who wants to stay on top of this rapidly changing topic. From the basics to long term Social Media strategy, this is the only resource book to have on your desk." 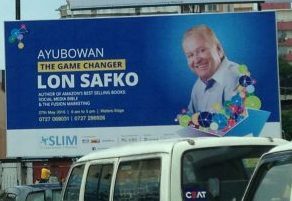 This book is an 800-pound guerilla when it comes to social media marketing. Four thumbs up! Great book! Loved it! It's huge and heavy and not particularly pricey. I found it to be well organized and well written. And it was certainly packed to the gills with content. There are 43 chapters split into three different sections: (1) Background basics & tactics, (2) Tools, & (3) Strategy. The chapters in the first part provide an introduction and framework regarding the book. The numerous chapters in the second part cover 100+ social media tools. And the last five or six chapters in the third part can help you do an audit of the social media marketing your company does (or doesn't do). The book is comprehensive. I haven't seen a book that covers so much and in such depth on the topic of social media marketing (or Internet Marketing). There were a ton of "Expert Insights" sprinkled throughout the text that really made the book shine. And each chapter ended with three summaries: (1) Commandments, (2) Conclusion, & (3) Readings & Resources. Each were well done. In particular the Readings & Resources for each chapter were better than most books have at the end of an entire book. 6 stars! PS. To see the chapter titles and how the book is specifically organized I encourage you to peek at the Search Inside feature Amazon offers for this book. With 43 chapters there are a lot of chapter titles to read. Ask a hundred people what "social media" is, and you may get a hundred different definitions. Frankly, social media doesn't just connect people--it baffles them, too. The authors of "The Social Media Bible," however, have made a considerable attempt at creating a resource that helps readers gain an overall understanding of the social media "ecosystem" (to put it in the authors' terms) and how the social media phenomenon relates to business. First, I think it's in order to discuss what this tome covers. Part I, Background Basics and Tactics, comprises the first 23 chapters. This section of the book defines social media, explains the different types of social media, and helps you understand why it's important. You get coverage here of everything from social networks to microblogging to virtual worlds. If you've read other books about social media, you may already be familiar with some of this content. If you're brand new to social media, you'll find it especially helpful. Part II, Tools, comprises chapters 24-38 and revisits the different categories of social media, focusing on current popular tools. The authors discuss each tool, focusing on who should use them and why; you'll even find some more technical information in these chapters. Although I appreciated the broad look at all the different types of the social media, I felt that the sections could have gone into more detail. However, you could easily write an entire book on each type of social media presented, so the authors clearly had to limit coverage of each type of social media resource. Part III, Strategy, includes the final chapters of 39-43 and offers some excellent advice on how to apply everything learned in the book. I appreciated the bits of advice spread throughout as well as the cohesive strategies presented. I especially found the chapter "The Four Pillars of Social Media Strategy" helpful, which discusses how a social media strategy should have goals of communication, collaboration, education, and entertainment. Although some of the principles in this book will endure, much of the descriptions for current social media tools will quickly go out of date (as some already have). However, the author clearly recognized this and intended it to be a timely book. If you're new to the concept of social media and seeking how to apply social media to your business, the "Social Media Bible" is a great resource. If you're already familiar with using social media, you may find yourself skipping some of the basic information in the book. Overall, I believe there is wisdom for everyone to find in this useful guide--the kind of wisdom that will help you to give new life to your company's online marketing efforts in the social media world. From A to Z- it's all here! 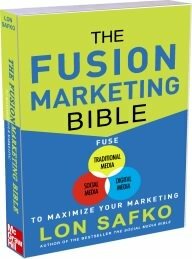 Lon Safko's 2nd edition of The Social Media Bible literally covers everything from A (apps) to Z (Zooomr) and everything in between. This is the most comprehensive book on social media available! If you currently use or plan to use social media in ANY form, I suggest you add this to your library TODAY! Rapidly advancing technology has produced new ways for individuals, groups, and businesses to communicate, collaborate, and market their products to consumers. Social media is leading the way in improving how business is conducted but many businesses and individuals are nervous about when and how to enter this new wave. In The Social Media Bible the author indicates the book is a comprehensive guide on social media intended to help readers increase revenues, profits, and competiveness in the marketplace. The book is divided into three main sections; part one, the background and basics of social media; part two, the plethora of social media tools available; and part three, developing a social media strategy. Within each of these sections the author provides the reader with the overall footprint of social media: its uses, platforms, and strategies currently employed by various companies. The book is well organized with each chapter providing definitions, examples of successful strategies, and multiple references that afford the reader a helpful guide should they continue their own research on the specific topic. Clearly the freshness of the content of any book on social media is limited given the rapid pace of technological innovation in the social media universe. However, for the reader who needs a starting point for discovering the basics of utilizing social media strategically, The Social Media Bible is an excellent resource from which to begin. Furthermore, the author effectively communicates the necessity for business leaders to get in the social media race or risk becoming extinct. This is true for both businesses and the individual business worker. Social media holds promise for improving both the internal and external communication strategies of companies. The book outlines both how social media can improve productivity as well as penetrate new and existing markets more effectively. The chapters on the various social media tools available provide the reader an extensive list of platforms to research, explore, and choose from when considering how one medium might be a more effective choice depending on the reader's particular business environment. The author could have improved the book by shortening the history and background section that contained too much basic information. In addition, for readers already active in utilizing social media tools in business it is doubtful they will discover any earth shattering new information in The Social Media Bible. However, for those just beginning to consider social media as part of their business strategy, the author does provide sufficient information readers will find helpful. Certainly there are companies and organizations that have yet to utilize social media as part of their overall business strategy. Readers who find themselves working for those companies will find the book to be effective in giving them an adequate knowledge base in social media that could be useful in educating their organizational leaders on the potential benefits of including social media in their business model. The book may also inspire some readers to launch new initiatives at their workplace or even to become entrepreneurs themselves. Great book. Really covers Social Media and related online marketing concepts (like SEO). Worth the price. And, the buying process was efficient, easy and painless. I would buy this all over again in a minute. The second updated edition of The Social Media Bible has been revised and updated with user feedback and content, and offers the latest techniques, platforms and technologies for understanding and effectively using social media marketing. Interviews with 50 experts accompany keys to winning in social media efforts in this fine survey, highly recommended for any business collection. If you need to know about Social Media - OWN THIS BOOK TODAY - Six Stars !!!! The BOTTOM LINE If you must know about social media (SM), this is the only book to get on the market RIGHT NOW. First of all it was copyrighted in September 2010. This material changes quickly and new books are being printed all the time. At this time this is the most current and best book on the market. If it involves the Internet, you do not want to order anything that is more than one year old. So my first tip is always look at the copyright date. Older than a year, it's no thank you. The second tip is that you want something that you do not need to read from cover to cover, so the table of contents and the index is very important. The author went to a 1000 people involved with the Internet and asked them what do you need from a social media book. More than 66% couldn't define social media, while 99% recognized that SM would have a direct impact on their firm's bottom line. Based on their input, the author selected and developed the chapters, and the content. The 723 page SM Bible is divided intelligently into 3 parts. Part I TACTICS This runs from page 3 to page 447 and is contained in 15 chapters. This is where you will find out about podcasting, vlogs, blogs, followers, SEO, life casting, and flaming among others. Part II TOOLS of the TRADE This section runs from pge 447 to page 675. Here you will find the results of 100 companies that the author interviewed including marketing providers, game platforms, and the software you will need, plus the apps, websites, text messaging, mobile insights, and e-mail. If you need to learn more about social media, if you need to employ it for your business on whatever level, this is the book for you until the next new thing comes along. You have to be current, and stay current, and that means you do not want an old book. If you are a one person company or you have a thousand people in the company, at the moment there is no better source of information than this book. I heartily recommend it and thank you for reading this review.